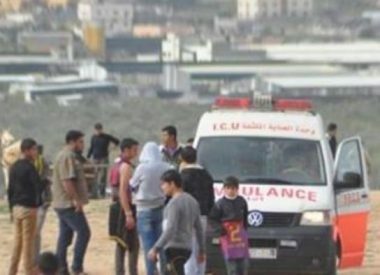 Israeli soldiers shot, on Tuesday evening, a young Palestinian man, and caused several others to suffer the effects of teargas inhalation, in Khan Younis, in the southern part of the Gaza Strip. Media sources in Gaza said the soldiers, stationed on military towers across the border fence, fired live round and gas bombs at Palestinian protesters marching on their lands, near the border fence. They added that one Palestinian was shot with a live round in his leg, and was rushed to Nasser Hospital, in Khan Younis, suffering a moderate injury. Many Palestinians suffered the effects of teargas inhalation, and received the needed treatment by medics at the scene.